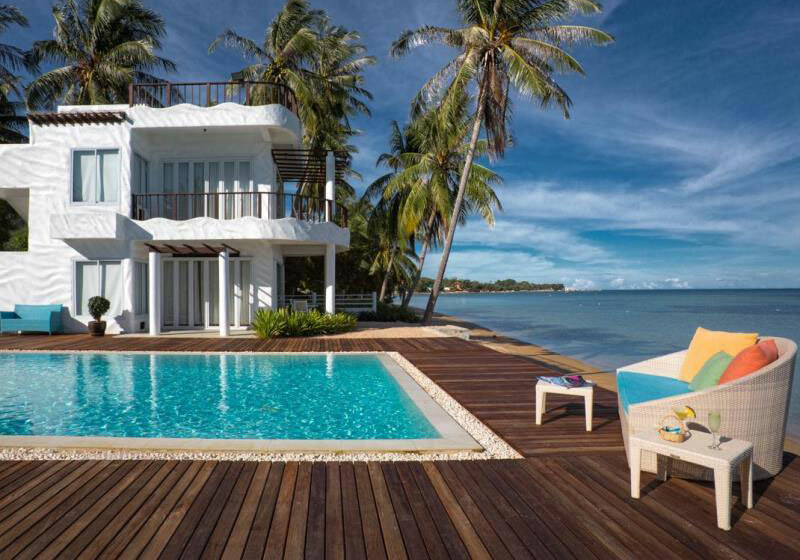 With eight villas, this hotel targeted at couples helps bring the Mediterranean style to the Thai island of Samui. With numerous smaller islands nearby, you can easily go island hopping, snorkeling at Koh Tao, or take part in the full moon parties at Koh Phangan. The villas are stark white, with colorful cushions and lamps used to decorate the room. All guests enjoy an open-air, rooftop Jacuzzi, rain shower, and herbal toiletries during their stay at Villa Nalinnadda Hotel. With all glass walls on at least two sides, there is no shortage of views no matter where you are. This secluded, beach front property is perfect for a romantic getaway weekend. Short Description: With eight villas, this hotel targeted at couples helps bring the Mediterranean style to the Thai island of Samui. With numerous smaller islands nearby, you can easily go island hopping, snorkeling at Koh Tao, or take part in the full moon parties at Koh Phangan.